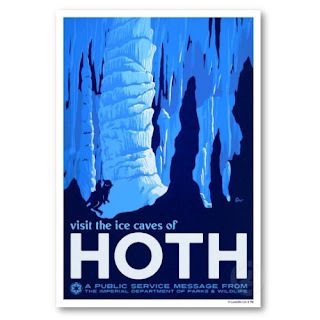 Born For Geekdom: Need to Make Travel Plans for Your Star Wars Geek? Need to Make Travel Plans for Your Star Wars Geek? Empire is the movie we always watch to decorate the Christmas tree. If you dig stuff like this, you may enjoy this book. A friend of ours got this for us as a Christmas gift last year, and we look through it often, especially when we long for some artistic inspiration. It's a book of art done by famous concept artist and matte painter Ralph McQuarrie and it's plum full of the art that went on to create the definitive "look" of Star Wars. 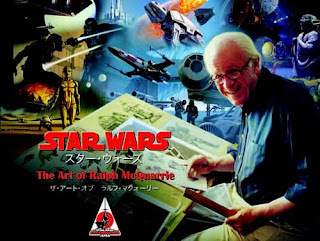 Due to copyright issues, the book had to be published overseas. 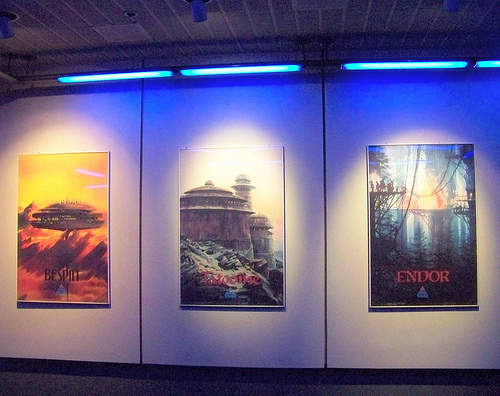 Here one last loving look at the travel posters as they hung at Star Tours. Who knows what changes will come with the ride revamp, currently underway? Travel posters for Bespin, Tattoine, and Endor, homes respectively to Cloud City, Jabba's Palace, and Yoda's Shack.